Badugi is a draw poker variant (no community cards) which isn’t exactly among the most popular poker variants in the world. There are only a handful of online poker rooms where one can play Badugi, and among these, only PokerStars seems to offer some competition at the Badugi tables. As far as its rules go, Badugi most closely resembles Lowball, in the sense that the lowest hand wins in Badugi too. The fact however that it uses completely different hand ranking than most of the other poker variants places it in a category of its own. 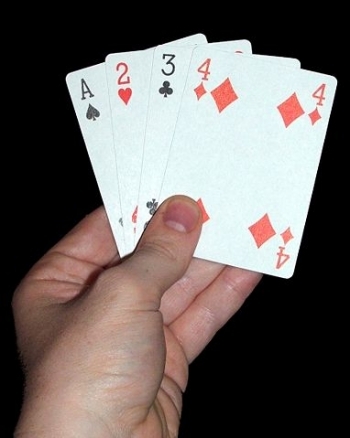 In Badugi, hands are made of 4 cards and the best possible hand, also known as a “badugi”, contains no pairs, and none of the 4 cards are suited. In addition, the 4 cards need to be as low as possible. A Badugi hand begins with the posting of the blinds. The blinds work the same way they do in Holdem and Omaha: the player to the immediate left of the dealer button posts the small blind which is half the size of the big blind. The big blind is posted by the player on the left of the small blind. The blinds are the catalysts of action. They provide the spark for the initial stages of the hand. Without the blinds, there would be no action whatsoever. The dealer then hands each player 4 cards face-down. Players take a look at their cards and the first betting round commences. In Badugi it is possible to pick up the best possible hand from the get-go. An example of one such ‘badugi’ would be As, 2d, 3h, 4c. During the first betting round, players can choose to call the BB, to raise it, or to fold. When the first betting round is over, those still in the game get to discard some of their cards and have them replaced with new ones. Players can choose to discard only one of their 4 pocket cards, 2 of them or 3 or the entire 4-card hand. Once the new cards are picked up, the second betting round commences. Online, players can replace the cards they deem useless by first clicking on them and then hitting the ‘discard’ button. The second betting round is followed by another draw and another betting round. The final draw precedes the 4th betting round, at the end of which, those who are still in action have to show down their hands. It is possible to win the pot by forcing all the other players to fold. In order to understand how basic Badugi strategy works, one needs to understand how Badugi hand rankings work. Players should always place their highest card first, because that’s what really determines the value of their hands. A 5,4,3,A is for instance better than a 6,3,2,A. If someone happens to have two suited cards in his hand, the higher one of those is discarded, in which case his qualifying hand will be a 3-card one. Two-card qualifying hands can win the pot too, provided no one else holds anything better. A 3-card Badugi hand is always better than a 2-card one and a 4 card one is always better than a 3-card one. When playing Badugi online, players will pay poker rake the same way they do at the Holdem and Omaha tables. Signing up for a rakeback deal is therefore always an excellent move as it will make it much easier for players to generate profit at the end of the day.